Say Goodbye To Soggy, Messy Stacks Of Paper Hand Towels With A More Convenient, Hygienic, Countertop Towel Solution. The Kleenex Hand Towels In A Pop-Up Box Are Great For Offices, Lodging Or Any Facility That Prefers Convenient Countertop Dispensing. Highly Absorbent Towels Deliver Exceptional Hand-Drying. Water-Resistant Coating And Poly-Shield Keep Box And Towels From Getting Wet. High-Capacity Box Of Towels Meets Epa Standards And Is Fsc And Ecologo Certified..
Say Goodbye To Soggy, Messy Stacks Of Paper Hand Towels With A More Convenient, Hygienic, Countertop Towel Solution. 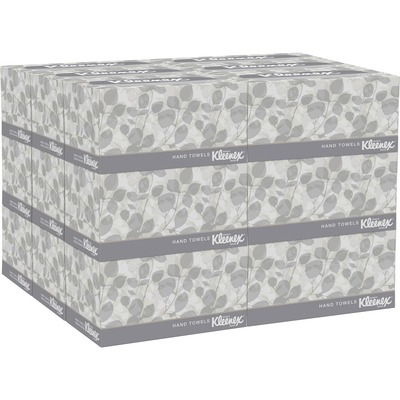 The Kleenex Hand Towels In A Pop-Up Box Are Great For Offices, Lodging Or Any Facility That Prefers Convenient Countertop Dispensing. Highly Absorbent Towels Deliver Exceptional Hand-Drying. Water-Resistant Coating And Poly-Shield Keep Box And Towels From Getting Wet. High-Capacity Box Of Towels Meets Epa Standards And Is Fsc And Ecologo Certified.